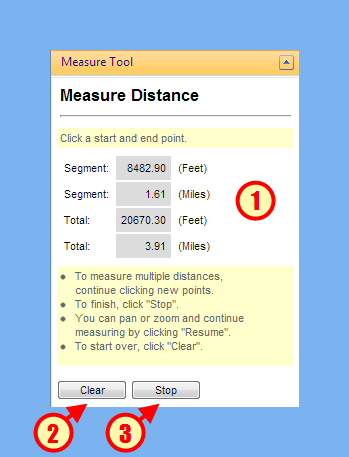 To begin measuring, left-click on the map to draw the starting point of your first segment in your measuring polyline. Each additional left-click on the map will end the current segment and continue the polyline into a new segment. When you're done drawing your measuring polyline, click on the "Stop" button and the measuring polyline will appear on the map. The current result of your measuring tool is shown here, broken down by the last segment length and total polyline length, in both Feet and Miles. To clear the current measuring polyline, click on the "Clear" Button. To stop measuring, click on the "Stop" button. When measuring is stopped, the "Stop" button will become the "Resume" button, which you can click if you want to resume measuring with the existing measuring polyline.